Pautrot was an excellent sculptor of both game birds and hunting dogs. Here he captures a lighter moment with a Pointer sitting and watching the two birds at his feet. The dog is alert and keeping his attention on the birds while they flutter around in front of him. A well sculpted and amusing small bronze which is a little different than the usual hunting theme of dogs with game birds. The Pointer has rather a surprised look on his face which adds to the interest of the piece. 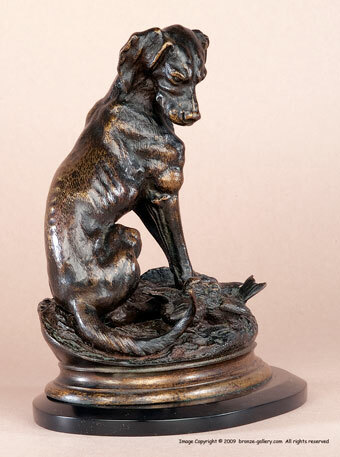 This bronze has a rich dark brown patina and is mounted on the original beveled black slate base. 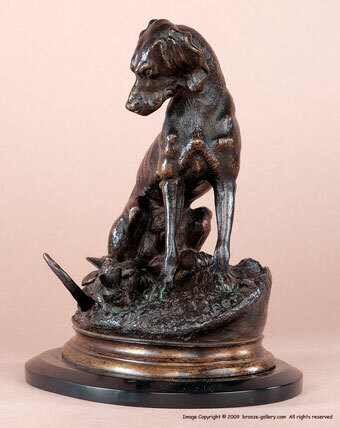 A rare model that is not often offered for sale, it is a fine example of Pautrot's expertise in depicting dogs and birds.